The movement is built in-house at the Nomos Glashutte workshops, and is manually winding with a power reserve of 43 hours. Water resistant to 100 meters. This watch features a sapphire crystal on the front with a solid case back. 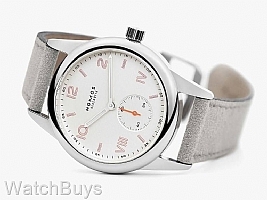 The strap is a light grey velour, and matches well both the color and design characteristics of the dial. We love the look of this new watch, and the long line of visitors at BaselWorld waiting to see it for the first time confirmed our suspicions that this watch would quickly become a bestseller for Nomos.